Fourteen years ago, my family and I planted a United Methodist congregation in Evans, Georgia. We were what is called in church-planting circles a “parachute drop,” meaning we had no pre-existing relationships in the community. We had no idea how blessed nor how challenged we would be. The work of planting a new church is, even in the best of circumstances, difficult. Women will almost certainly find it to be very difficult. George Barna reports that between 1999 and 2009, the percentage of women pastors doubled; yet, the rate of growth among women church planters has not kept pace. How can the church best affirm the call of women uniquely gifted to start new churches so they have the best opportunity to succeed? For the sake of advancing the Kingdom of God on earth, it is a question worth answering. What resources can be unleashed so women can succeed as planters in the twenty-first century church? And what changes must be embraced so women are better equipped to master the barriers they face? Let’s begin with a look at some of the barriers faced by women who plant and lead churches. The argument against female leadership within the church begins in the Garden of Eden, with the question of whether female subordination is a fact of creation or a result of the fall. A resurgence in reformed theology leaves many believing women are not designed for leadership. For instance, John Piper is quick to point out that women can lead women and children, just not men. Clearly, women — especially theologically, conservative women — face a significant theological barrier to leadership, a barrier that will not disappear anytime soon. Contra Piper and others, the Wesleyan Covenant Association believes otherwise. WCA President Keith Boyette wrote earlier this year, “the Wesleyan Covenant Association is fully committed to and celebrates women serving as leaders, preachers and teachers in the life of the church and beyond.” You can access additional resources to explore the topic in greater depth through links at the conclusion of Keith’s article. Consciously or not, many people view women leaders in a different and perhaps negative light. There are deep-seated norms about leadership in the church, and when women violate them, they often pay a price. For instance, people tend to link assertive behavior with men, and find it unattractive in women. This perception places women in a double bind. Several studies have demonstrated that when women succeed in occupations predominantly populated by men they are often less well liked. And when they assume a predominantly male role and are perceived as nice, they are often not respected. These circumstances often undermine women in ministry. Much like the proverbial chicken-and-egg question, it is difficult to say which comes first: do many women tend to have low self-esteem because of the negative perceptions of them as leaders, or does their impaired self-image create negative perceptions that disable their leadership capacity? The answer is, “Yes.” Self-image and outside perception feed on one another. Women who struggle with a negative self-image as they enter leadership roles will find themselves on a steeper climb than those who don’t. And women with a healthy self-image will find it threatened as they confront negative stereotypes. Finally, it must be acknowledged that the seasons of life for women are markedly different than for men. From childbearing years to midlife, women experience distinctive seasons that may present vocational challenges. This factor has been debated and discussed in volume after volume so the question of whether it ought to be cannot be answered here. The assumption is that it simply is, and is something women will need to acknowledge if they want to lead past it. The emerging picture is not particularly attractive for women. There seems almost to be a fundamental dissonance between women’s ways of leading and the dynamics present in church culture. 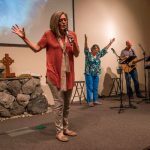 What tools and training can be placed into the hands of women called to the ministry of church leading, so that those who hear that call will have every resource at their disposal? Here are few areas ripe for exploration. When a United Methodist pastor is ordained, the bishop lays hands on her and charges her to “take authority as an elder.” How do women understand what authority looks like specifically for them? There is a need for solid theological teaching to counteract cultural understandings of leadership as well as internal pressures to perform in prescribed but unnatural ways. Because women in general are connected learners and value building relationships and working collaboratively, team building becomes a natural strength for church development. Networking is a key factor in the success of secular businesswomen. In short, familiarity breeds likability and respect. Finally, women leaders need permission to lean in and enjoy this journey at a sustainable pace, recognizing that while they might have to work harder to make success happen in their context, there is also a limit to their time and energy. If a woman wants to succeed as a leader, she must value time with family and time to refuel. The point of leading is not just to succeed, but to enjoy the work God has given. Given all the challenges the church will have to confront in the 21st century it is imperative it nurture and equip women to lead. This is the third of three articles by the Rev. Carolyn Moore on women in Scripture and in ministry. You can read the previous articles here and here.